It’s May and if you have a Roth and Ramberg calendar it’s time to turn the page. 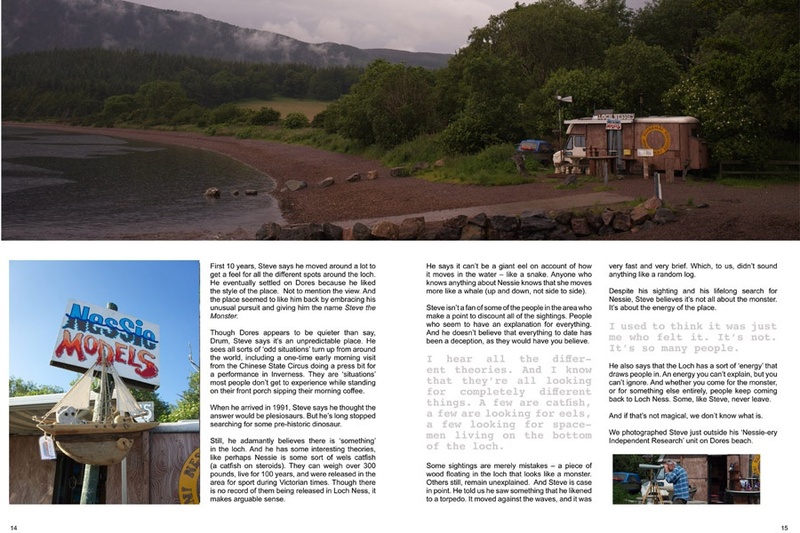 This month’s photo is of a man named Steve Feltham who lives on the shores of Loch Ness in a town called Dores. He spends his days making Nessie models out of clay, and more importantly, looking thru his bincoulars watching the water hoping to catch a glimpse of the Loch Ness Monster. We spent a few days trying to find Steve the ‘Nessie’ Hunter. We visited his converted van which is situated on the edge of Loch Ness, only to find no one around. Finally with the help of local taxi driver named Ronnie, we were enjoying a beer with Steve on his deck and talking about the famous monster. While we were listening and talking, Steve mentioned that there is just something magical about the Loch and we definitely agree. It has a mystique that draws people there. If you ever hear any stories about the Loch Ness Monster, chances are they’ve asked Steve for his opinions. Something is out there and maybe it’s best for everyone if we never find it?